Perform DBSCAN clustering from vector array or distance matrix. 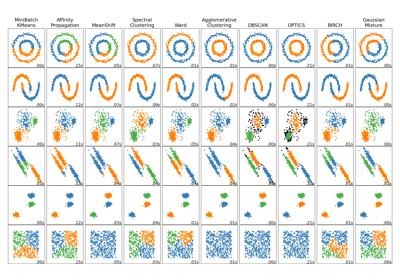 DBSCAN - Density-Based Spatial Clustering of Applications with Noise. Finds core samples of high density and expands clusters from them. Good for data which contains clusters of similar density. The maximum distance between two samples for one to be considered as in the neighborhood of the other. This is not a maximum bound on the distances of points within a cluster. This is the most important DBSCAN parameter to choose appropriately for your data set and distance function. The number of samples (or total weight) in a neighborhood for a point to be considered as a core point. This includes the point itself. The metric to use when calculating distance between instances in a feature array. If metric is a string or callable, it must be one of the options allowed by sklearn.metrics.pairwise_distances for its metric parameter. If metric is “precomputed”, X is assumed to be a distance matrix and must be square. X may be a sparse matrix, in which case only “nonzero” elements may be considered neighbors for DBSCAN. New in version 0.17: metric precomputed to accept precomputed sparse matrix. The algorithm to be used by the NearestNeighbors module to compute pointwise distances and find nearest neighbors. See NearestNeighbors module documentation for details. Leaf size passed to BallTree or cKDTree. This can affect the speed of the construction and query, as well as the memory required to store the tree. The optimal value depends on the nature of the problem. The power of the Minkowski metric to be used to calculate distance between points. The number of parallel jobs to run. None means 1 unless in a joblib.parallel_backend context. -1 means using all processors. See Glossary for more details. Copy of each core sample found by training. A similar clustering at multiple values of eps. Our implementation is optimized for memory usage. For an example, see examples/cluster/plot_dbscan.py. This implementation bulk-computes all neighborhood queries, which increases the memory complexity to O(n.d) where d is the average number of neighbors, while original DBSCAN had memory complexity O(n). It may attract a higher memory complexity when querying these nearest neighborhoods, depending on the algorithm. One way to avoid the query complexity is to pre-compute sparse neighborhoods in chunks using NearestNeighbors.radius_neighbors_graph with mode='distance', then using metric='precomputed' here. Another way to reduce memory and computation time is to remove (near-)duplicate points and use sample_weight instead. cluster.OPTICS provides a similar clustering with lower memory usage. Schubert, E., Sander, J., Ester, M., Kriegel, H. P., & Xu, X. (2017). DBSCAN revisited, revisited: why and how you should (still) use DBSCAN. ACM Transactions on Database Systems (TODS), 42(3), 19.
fit(self, X[, y, sample_weight]) Perform DBSCAN clustering from features or distance matrix. 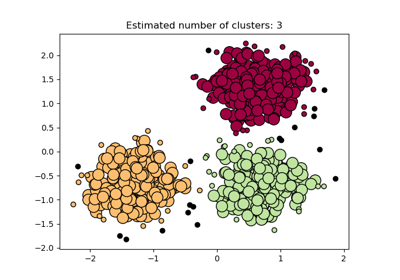 fit_predict(self, X[, y, sample_weight]) Performs clustering on X and returns cluster labels. Perform DBSCAN clustering from features or distance matrix. Weight of each sample, such that a sample with a weight of at least min_samples is by itself a core sample; a sample with negative weight may inhibit its eps-neighbor from being core. Note that weights are absolute, and default to 1.